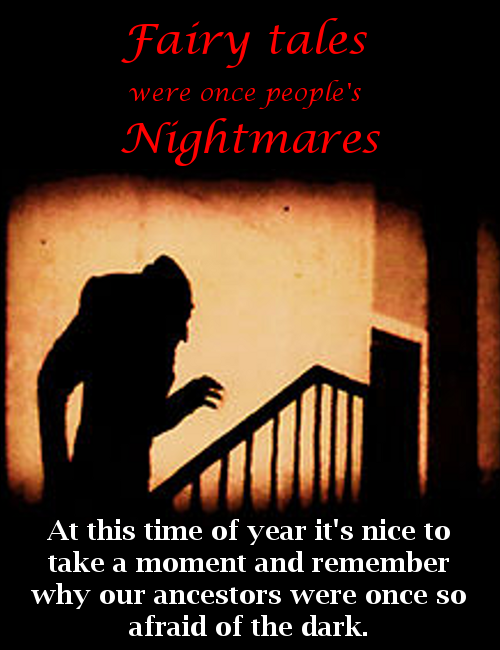 At this time of year it's nice to take a moment and remember why our ancestors were so afraid of the long dark nights. For now is the time that the spirit world, the world of ghosts, forgotten gods, and fairies overlaps with ours, and it's important to remember why that's so horrifying. macabre tales they once were. 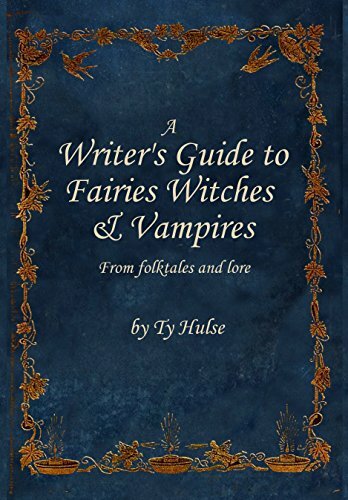 The best thing you can do to gain inspiration from fairy tales is to read them a little differently, searching for the darkness at their heart, drawing on them for inspiration to startel, shock, and above all, give that tingling sense of fear that your readers are seeking from horror. "She opened the door and felt at once that something terrible had happened. The fire had gone out. The cat's back was bristling. She hastened to the cradle where, instead of seeing her babies round and rosy face, she beheld a hideous dwarf with a dark and spotted face. He had a huge and gaping mouth; his hands and feet were evil, threatening, jagged claws. "Merciful heavens!" she cried in fear. "Who, are you? What have you done with my blessed child?" The dwarf answered never a word, but grinned a wicked grin." Fairies are often blood thirsty, so in place of this woman’s beautiful child something is left which could very well be evil; something which might drink her blood in the night, murder her neighbors, bring death and plague. Yet, these mothers can't ever be completely certain that the changeling isn't their baby, they just have a feeling, a sense that something is very, very wrong. The way the child screams, the way it grins, its cold calculating eyes, all scare her; but what can she do? She is trapped, treating the child like her own even though she is now terrified of it. Fairyland is filled with rivers of blood, with fields of corpses, with people who eat human flesh without knowing it, for it’s common in fairy tales for the wicked to share human flesh with the unsuspecting. In “The Juniper Tree” the wicked step-mother of a boy cuts off his head, then cooks him and serves him to his unsuspecting father who smacks his lips with pleasure at the unexpectedly tasty meat. Once in a poor village the boys and girls would hold their parties in abandoned houses. Here they would sing so loudly and have so much fun you could hear them clear on the other side of the village. They danced about, and the boys did tricks to impress the girls, and soon they were all shaking with laughter. Late one night when they were partying, three unknown young men came through the door. "Good evening," everyone greeted happily inviting them to join the general merriment. As the strangers began to dance one of the girls dropped a spindle. It rolled across the crowded dance floor and right under the feet of one of the strangers. When she bent to pick it up she noticed that the boys had hooves instead of feet (according to another version, she saw their tails). Her heart began to race, he throat went dry, their mystery guests were vampires. Carefully she whispered of her discovery to her friends, warning them each of the danger, and one by one the people began to slip away from the party to flee, but they forgot one girl who was napping behind the stove. The girl's all ran forward, happy to see that their friend was alright, but when they got into the house they started shrieking in horror. The vampires had sliced the girls face into a permanent smile, before placing her head on a stake by the window. The ceiling and walls were decorated with her guts and flesh. There was once a young fellow who was ridden by "Marre " every night, and although he sprinkled flax-seed outside the door, and placed his shoes the wrong way before his bed, it was all of no avail, and he was at a loss what to do. He asked a wise woman for advice, who at once said that she knew what would help him. "When you go home," she said, " you must stop up all holes and chinks that there are in your room; the keyholes and windows must also be made fast. When that is done, you must bore a little hole in the door, and cut a pin to fit it exactly; this hole you must leave open to-night, but as soon as Marre has come in by it, spring to it and put in the pin, then she is in your power." The man did as the woman told him. During the night the Marre came in by the hole, which he immediately stopped up, to her great alarm. She went round about from keyhole to window, and made herself both small and thin to get out, but every place was closed fast, so that she could not get out, however many tricks she tried. When she saw that all her trouble was in vain, she besought him to take the little pin out of the door, and let her go as she had come, and she would never come again. Meanwhile he had been standing looking at her, and saw that she was a pretty girl, so he would not let her go in that way, but asked if she would be his sweetheart, and everything would be all right. "Yes," said she, "if you will really marry me, the mischief is over; let me out now like any other person." She was a girl from the next village, and when he knew that, he let her out at the door. Shortly after they had their wedding... and while in this version of the fairy tale she gave up her ways, most witches could not... oh no, the evil being which they worked with would not allow it. One witch tried to stop and the evil spirits surrounded her and beat her, kicked her, tortured her until her mind cracked and they could once more force her to do evil. One man had himself locked away so that he would starve to death and not have to do evil any longer, as dying was his only way out... though dead witches usually became vampires so perhaps even death isn't a release. A poor herdsman was journeying homeward across the moors one windy night, when he heard at a distance among the tors the baying of hounds, which he soon recognised as the dismal chorus of the dandy-dogs. It was three or four miles to his home; and, very much alarmed, he hurried onward as fast as the treacherous nature of the soil and the uncertainty of the path would allow; but, alas! the melancholy yelping of the hounds, and the dismal halloa of the hunter came nearer and nearer. After a considerable run, they had so gained upon him, that on looking back -- oh, horror! -- he could distinctly see hunter and dogs. The former was terrible to look at, and had the usual complement of saucer-eyes, horns, and tail accorded by common consent to the legendary devil. He was black, of course, and carried in his hand a long hunting-pole. The dogs, a numerous pack, blackened the small patch of moor that was visible; each snorting fire, and uttering a yelp of an indescribably frightful tone. No cottage, rock, or tree was near to give the herdsman shelter, and nothing apparently remained to him but to abandon himself to their fury, when a happy thought suddenly flashed upon him, and suggested a resource. Just as they were about to rush upon him, he fell on his knees in prayer. There was strange power in the holy words he uttered; for immediately, as if resistance had been offered, the hell hounds stood at bay, howling more dismally than ever ; and the hunter shouted "Bo shrove!" "which," says my informant, "means, in the old language, the boy prays." At which they all drew off on some other pursuit, and disappeared. The world was a horrifying place where death, poverty, illness, and even sorrow were all 'living' beings. They were vampires, fairies, witches, fickle gods, and more. In a way this was comforting, because while nearly everyone was killed by the witches and vampires there was hope that one could overcome and defeat these monsters eventually, though sometimes that's a painfully hard row to hoe. A dark tale about a girl who is tortured by a vampire she unwittingly gets engaged to. The tale of a girl who must rescue her love form the court of the dead on Halloween. The tale of the spirit of the Moon being captured, tortured, and buried alive. The tale of some wicked bogeymen which devour a girls family then carry her off in a bag so that they may torture her further.